The Agile Business Advanced – Maximizing Value certificate is meant for people who work with Agile Scrum in a non-IT context. The certificate establishes your knowledge of Scrum and your ability to apply it. It focusses on the Product Owner role within Scrum and obtaining this certificate demonstrates your expertise as Product Owner in a non-IT context. As Product owner in a non-IT context you are capable of maximizing project result values for customers. You achieve optimal utilization of scarce resources with professional stakehold management and proper prioritizing of activities. You have ongoing contact with customers about project results and reach the right solution step by step. With this certificate you will be of interest to employers who want to introduce or apply Scrum in predominantly non-IT teams. 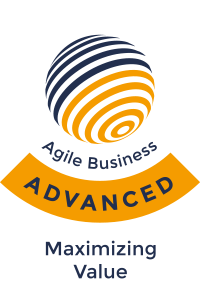 The Agile Business Advanced – Maximizing Value certificate is meant for professionals who have in depth knowledge of the Product Owner role within a non-IT environment. Considerable theoretical comprehension is required for this certificate; please make sure you studied the curriculum extensively. Practical knowledge is not mandatory but gives a clear advantage. Costs of certification are €149 (including taxes) for each attempt. The certificate has no expiration date and is valid indefinitely.